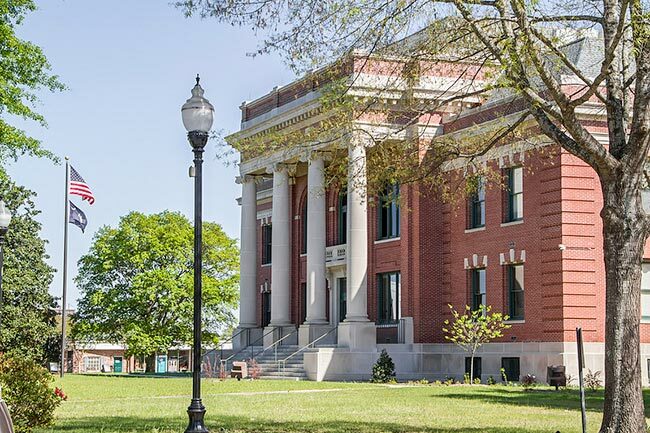 The Clarendon County courthouse in downtown Manning was completed on January 5, 1910. Clarendon County was formed in 1868, though the district has been redrawn and renamed several times since its days as a parish. The area first belonged to St. Mark Parish in 1757, followed by Camden District in 1769. The district was then named Clarendon County in 1785 before then becoming part of Sumter District (now Sumter County) in 1799. In 1855 the area became Clarendon District, and finally Clarendon County – again – in 1868. Clarendon County is named for Edward Hyde, Earl of Clarendon, one of the Lords Proprietors. The Lords Proprietors of Carolina consisted of eight men granted land in North America by King Charles II in the mid-seventeenth century to established the colony of Carolina. On the courthouse grounds are a Civil War veterans memorial and two markers honoring Jake Williams and William Burgess, who were both killed in action during World War I. The Manning Commercial Historic District is significant architecturally as an intact collection of buildings associated with the governmental and commercial growth and development of Manning as the county seat for Clarendon County from ca. 1890 to 1958. The district is also architecturally significant as an example of the commercial development and evolution of a small southern agricultural center during the first half of the twentieth century. 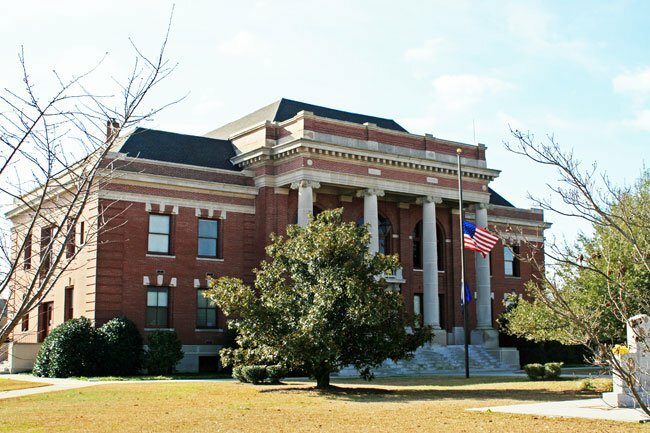 As a county seat town, Manning’s downtown is dominated by its 1909 Neo-Classical, red brick courthouse set at the center of a landscaped courthouse square. As with many such towns in the rural Southeast, Manning’s commercial district is characterized by one- and two-part commercial block buildings, many of them brick, that were constructed during the late Victorian and early twentieth century period. One event in particular, the devastating 1915 tornado, resulted in a building boom for Manning in the immediate aftermath of the tornado. Many of the shopfronts associated with these buildings have been modified with the installation of aluminum and glass windows and entrances, but most retain a number of original architectural details that allow the district to reflect a remarkable degree of integrity. Oblique and angled entrances, intriguing decorative cornices and corbeling, and a preponderance of parapeted rooflines give the Manning Commercial Historic District a clear and unmistakable association with the architecture typical of the early twentieth century. Although the cumulative effect of some alterations classifies twelve buildings as non-contributing, forty-six buildings maintain significant architectural integrity and contribute to the historic district’s ability to convey its character from the period of significance. This is Brandon Coffey and I took the first photo on the page, if this is the one you are interested in I can email you a copy. Just let me know. Where can I get prints to frame of our courthouse?